If you’re looking for advice on asking for feedback after a job rejection, you’re in the right place. Should you ask via phone or email? I’d recommend asking the employer for feedback soon after they tell you they decided not to hire you. If you receive a rejection email, I’d respond within 24 hours (wait at least a few hours though; you don’t want to sound desperate or panicked). If they call you and tell you the bad news over the phone, ask for feedback right on that phone call. And we’ll talk about exactly how to do that in a second. One last scenario: If they call you, and you aren’t able to answer so they left a voicemail, I’d call them back to ask for feedback on the phone. If you’d prefer to write an email, you can, but I think calling is better. Call during business hours, and if you don’t reach them, hang up without leaving a voicemail. That way you can try back one more time to try to get them live on the phone. If not, you can leave a voicemail. If they’ve rejected you after an interview because your interview went badly, they aren’t going to change their minds now. So asking for feedback should be all about improving yourself, finding out what you could do differently in future interviews, or what skills and experiences you could look to add to your resume moving forward. This is not an argument, or a chance to persuade them one last time. It’s not going to work, and it’s going to make you look desperate. How you start the call or email will make a big difference in the response you get. So make sure not to sound upset or bitter that they didn’t choose you. Try to sound calm and professional. You should already be focusing on other opportunities and applying for other jobs. This call or email is all about gathering info to help you get hired by those other employers. So you really need to sound like that. They’ve made their decision. One reason why it takes so long to hear back after an interview is because they are careful in their decision. If they tell you that they decided to move in a different direction, they’ve made up their mind. So this call or email should not be about trying to change their mind. You’re gathering feedback and trying to get them to share information that will help you get *other* job offers. Arguing with them will not help you do that. So you don’t want to start the call by trying to persuade them to reconsider. That’s going to completely kill your chances of getting any useful feedback. Leave things on good terms so they remember you as a great candidate that they can think of in the future for other positions. By doing this, you can also network with them in the future. Even if they don’t ever directly hire you, maybe they end up connecting you with somebody who does hire you in a few years. So if they share any feedback at all, thank them for it. Don’t argue or make a counter-argument. Many employers will not provide any feedback after rejecting you. Even if you follow the steps here, you won’t get feedback from every employer. Why? Company policies and advice from their lawyers often prevents HR and hiring managers from sharing much feedback. So as frustrating as this can be, realize that they do not have to share anything. And if they do share feedback, it really is a favor they’re doing, and a sign they’re a great company in terms of how they treat candidates. This might be difficult to hear if you’re struggling to find a job, but getting angry at an employer that does take the time to give you feedback won’t help. I mentioned above that you shouldn’t be arguing or trying to persuade them to reconsider you for the job (because it won’t work). That’s how you can leave the door open in a professional way… without arguing… without sounding angry… and without sounding needy or desperate. If you follow the steps above, you’ll be more likely to get feedback after job rejections. 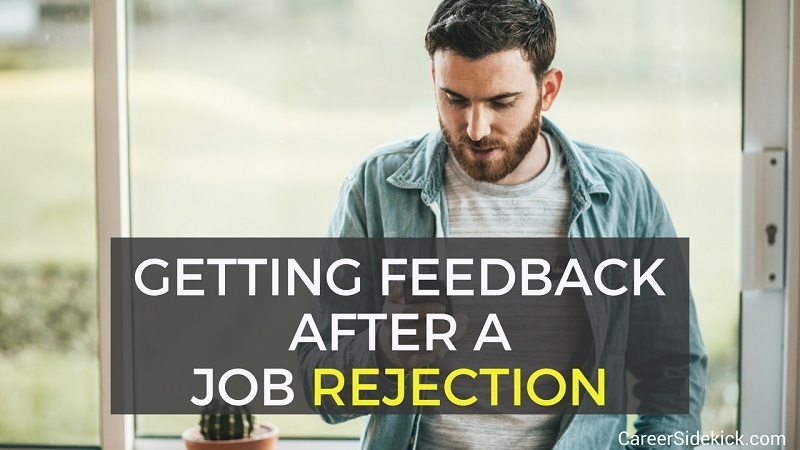 You’ll never get feedback from 100% of companies you ask, no matter how you respond to a job rejection – some employers just do not share this info. But you’ll have a much higher rate of success. Then you can use the feedback to improve your interview skills and boost your chances of getting a job offer in your next interview!